While there is much sympathy for mental health sufferers, stigmatization is widespread. India is currently home to a population of over one billion citizens. A study conducted by the Word Health Organization in 2015 shows that one in five Indians may suffer from depression in their lifetime, equivalent to 200 million people. Due to the stigma associated with mental illness, a lack of awareness, and limited access to professional help, only 10-12% of these sufferers will seek help. The Live Love Laugh Foundation (TLLLF) is a charity that aims to create awareness of mental illness and reduce the stigma associated with it, with a particular focus on stress, anxiety and depression. The Foundation commissioned How India Perceives Mental Health: TLLLF National Survey Report 2018 to help gauge India’s mental health landscape with the objective of exploring perceptions surrounding mental health and mental illness in India. The study further explores the level of sensitivity, attitudes towards mental health, and the level of stigma associated it. The study took place across eight cities in India over a span of 5 five months and involved 3,556 respondents. The study revealed three broad segments of people based on their attitudes towards mental illness. 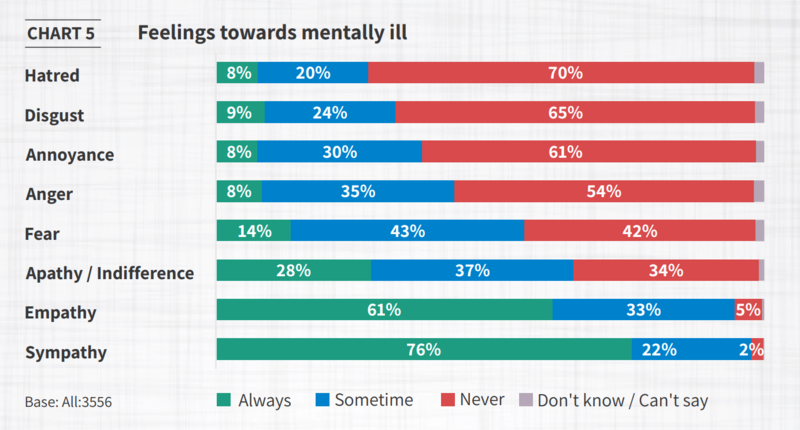 The study showed that while 87% of the respondents showed some awareness of mental illness, 71% also used terms associated with stigma. 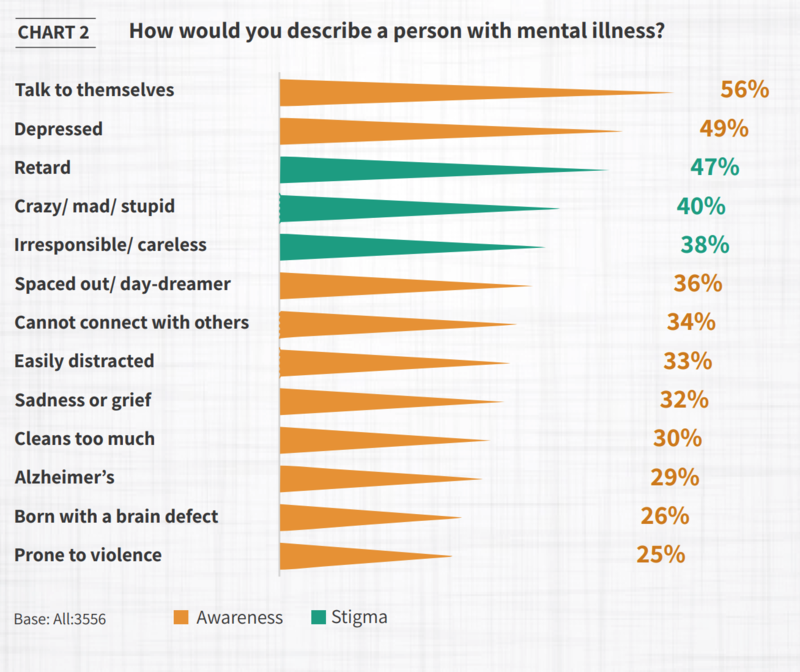 This shows that stigma and awareness are two separate issues although interlinked. They need to be addressed in parallel in order to tackle the burden of mental illness in India. If individuals continue to view mental illness with apprehension and resistance, it will remain difficult for people with mental health concerns to seek the support they require due to the fear of being labelled or judged. 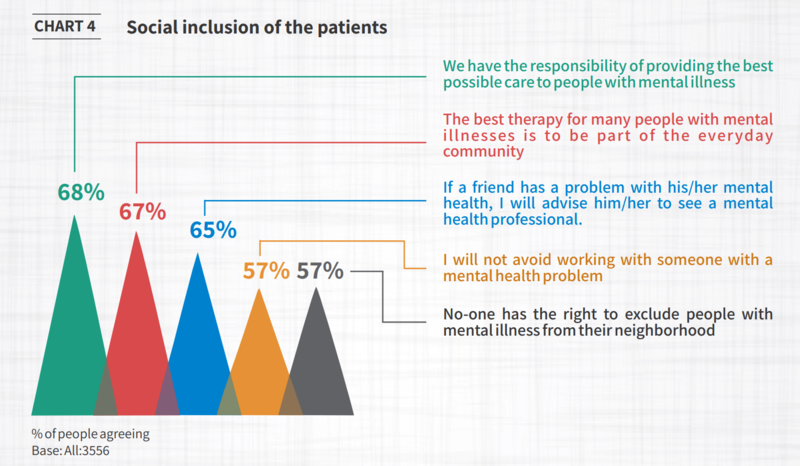 A majority of respondents appreciate the importance of social support for people with mental illness, but while 68% agree that we have a responsibility to provide the best possible care for sufferers, the number of people who believe no one has the right to exclude people with mental illness from their neighbourhoods is comparatively lower (57%). 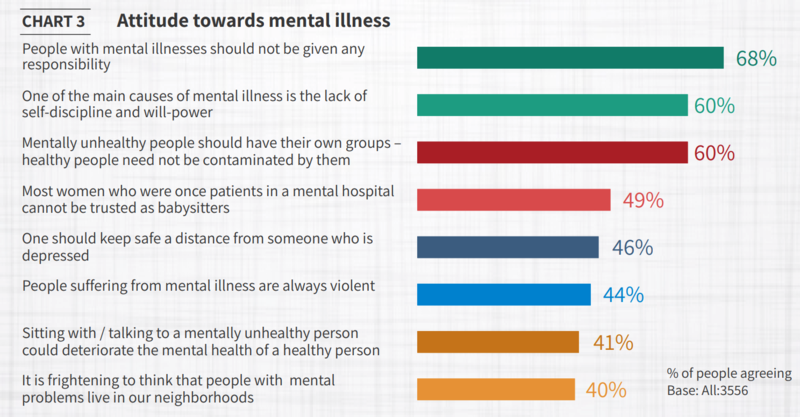 Respondents were asked about their feelings towards people with mental illness. While there exists widespread sympathy towards sufferers, with more than 75% of participants stating they would always feel sympathetic towards them, they also exhibit feelings of fear (14% would always be fearful), hatred (28% feel hatred sometimes or always), and anger (43% feel angry sometimes or always) towards people with mental illness. More than a quarter admitted that they would always be ‘indifferent’ towards people with mental illness. This admission of the general public to their feelings towards people with mental illness again indicates the prevalent stigma in society. The need of the hour is to sensitize and educate individuals about the signs and symptoms of mental illness while normalizing the idea of seeking support for themselves and their loved ones. There needs to be more open discussion and dialogue with the general public, and not just experts on this subject, which will in turn help create a more inclusive environment for people with mental illness.